Free agency, the NFL Draft, and organized team activities are officially in the rearview mirror for the New England Patriots. With training camp upcoming, the Patriots office at Last Word on Pro Football has been breaking down the roster position by position. So far, we have covered running backs, wide receivers, offensive line, linebackers, cornerbacks, and safeties. This week, we breakdown of the New England Patriots defensive line. The New England Patriots defensive line was arguably the weakest link on defense last season, and Bill Belichick set out to fix that with the addition of former Atlanta Falcon Adrian Clayborn. While Clayborn isn’t the strongest run defender, he’s certainly an upgrade on what the Patriots sent out last season. He thrives as a pass rusher and is great at collapsing the pocket. While he doesn’t always finish the play, he’s still an above-average starter who should drastically improve the defense. Trey Flowers has proven to be one of the best steals of the 2015 NFL Draft. 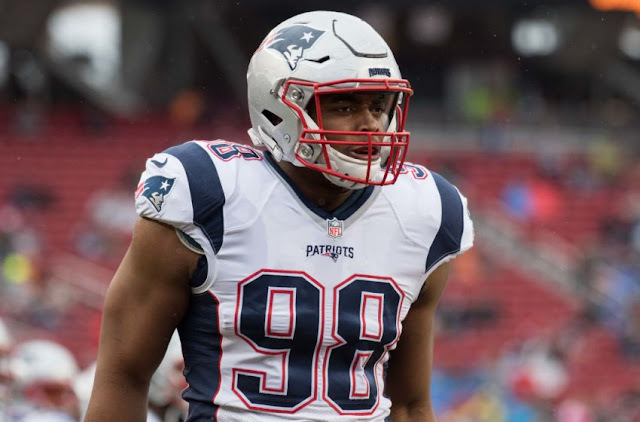 After missing essentially all of his rookie year, the former fourth-round pick has established himself as the Patriots best defensive linemen the past two seasons. He’s a monster setting the edge against the run and getting to the passer. His numbers were down last year, but that was mostly due to factors outside of his control. Thanks to an abundance of injuries on the defensive line, Flowers was essentially the only difference-making edge defender for most of the season. Because of this, teams put more effort into blocking Flowers, knowing that the other defenders couldn’t beat the one-on-one matchups. With Clayborne by his side, teams can no longer do this. Expect a big uptick in production out of Flowers this season. The 2017 Patriots were uncharacteristically bad against the run last season. While most of that was due to a lack of edge defenders, the interior run defense hasn’t been great either. Fortunately, Belichick addressed that need by trading for run-stuffer Danny Shelton. Shelton, the former first-round pick of the Cleveland Browns, is an immovable object in the middle of the defensive line. While he offers nothing as a pass rusher, he’s a perfect space eater capable of taking up double-teams. The Patriots love having guys like this, as it frees up their linebackers to make plays in the backfield. Former first-round pick Malcom Brown has improved every season in the league and has turned into an above-average starter at defensive tackle. He’s solid against the run and is good for about three sacks per season. He won’t be on any Pro Bowl teams, but he’s a solid starter who’s more than capable of doing his job. On a Belichick defense, that’s really all you can ask. Lawrence Guy was one of the bright spots along the Patriots defensive line last season. After departing the Baltimore Ravens in the off-season, the first-year Patriot recorded 58 tackles and one sack, serving as the team’s second defensive tackle. He was quietly a solid starter for the Patriots, earning a 76.6 ranking from Pro Football Focus. The New England Patriots love to rotate their defensive tackles, and these three players should see the most snaps. Each one is more than capable of eating space in the middle and stuffing the run. While none will rack up sacks, that’s typically not what the Patriots ask of their interior lineman. This should be a solid unit who can win at the point of attack and do the dirty work in the trenches. Edge Near-Locks: Derek Rivers, Deatrich Wise Jr. While these players don’t quite have the roster security of Flowers and Clayborn, it would take a lot for either to miss the Week One roster. Thanks to several key injuries along the defensive line, then-rookie Deatrich Wise Jr. saw significant playing time in 2017. All things considered, the rookie did a great job with the expanded role. Playing as the second edge defender for most of the season, Wise recorded five sacks his rookie year. While he wasn’t an All-Pro by any means, Wise was able to provide somewhat consistent pressure en route to being the best rookie on the 2017 Patriots. If he can improve his play against the run, he’ll be one of the better depth pieces in the league. New England drastically missed Derek Rivers along the defensive line last season. Rivers went down in the preseason with a season-ending ACL injury, but he’s fully recovered and ready to go. Rivers should be one of the most well-rounded guys on the defensive line, as he has the size to set the edge while his college tape shows a player capable of blowing up tackles on a play-by-play basis. Nobody knows how missing his rookie year will affect his development, and he may come out of the gate slow because of it. However, if he finds the form which merited a third-round selection, Rivers could push Clayborn and Flowers for a starting spot. These three players are battling for a maximum of two roster spaces, and each one brings a different element to the table. As a rookie, Adam Butler outplayed every expectation set upon the undrafted rookie. Butler is a decent interior pass rusher, consistently recording pressure during his rookie year en route to posting two sacks. However, Butler is a subpar run defender and gets pushed around by larger offensive linemen. As of now, he’s nothing more than a situational interior pass rusher. Vincent Valentine is arguably the best of these three if he’s healthy. However, the 2016 third-round pick missed the entirety of the 2017 season, so health isn’t a guarantee. As a rookie, Valentine was the third or fourth defensive tackle on the roster, normally being used as a run stuffer. While he lacked consistency, he did have a knack for producing big plays (3:59). Eric Lee is the odd-man out here. After joining the 2017 Patriots via the Buffalo Billspractice squad, Lee enjoyed an improbable two-week stretch of immediate success. In his first two games with the squad, Lee recorded 2.5 sacks, eight tackles, and a red zone interception against his former team. Unfortunately for Lee, his season went downhill from there. The former Bill recorded only one sack the rest of the season and was a constant liability against the run. He doesn’t have the size to be a defensive lineman or the speed to be a linebacker. He’s not a good enough pass rusher to serve a situational role, and it’s hard to see a fit for him on this team. Of the eight spots, seven of them are fairly set in stone. The eighth spot, for now, goes to Adam Butler, although Vincent Valentine could easily steal it. The reason Butler earns the nod now is that his production is more recent. Valentine missed the entirety of his sophomore season and has health injuries dating back to college. Meanwhile, Butler has remained relatively healthy throughout his career. Additionally, Butler is capable of lining up inside and outside, while Valentine stays in the middle. Granted, Butler is considerably better on the inside, but he lined up wide on multiple occasions in 2017. Belichick values versatility in his defenders, and that’s especially true with depth pieces. While Malcolm may be gone, chances are there will still be a Butler on the 2018 Patriots.